Unfortunately I couldn’t figure out how to add the stripes without making the shawl look like a Frankenstein monster of three individual scarves mashed together. So I felt my best option was to just make a scarf highlighting just one of them. I added aqua coloured Tencel bands to the edges to make up the width needed. 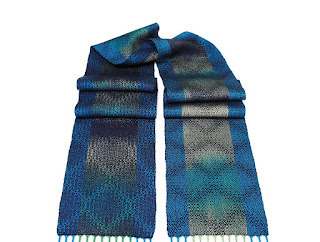 I found a lovely Crackle design on Handweaving.net that is a large diamond motif; they are large enough to show the colour changes in the painted warp. The weft I chose is navy Tencel. The diamonds have a lovely embossed feel to them. and I think it really looks lovely. The scarf is two sided, a dark side highlights the navy blue diamonds and the light side that highlights the hand dyed warp with the splashes of colour. The finished scarf is quite lovely. 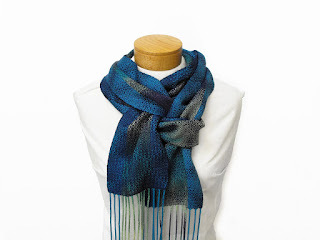 I like the framing that the blue Tencel gives to the scarf. For Sale. Final Garden Shot is a wonderful explosion of colour. The new lime green of the ornamental grass against the last of the purple flowers on the heather. It is nice to see some colour in the garden because it has been a very grey spring so far. 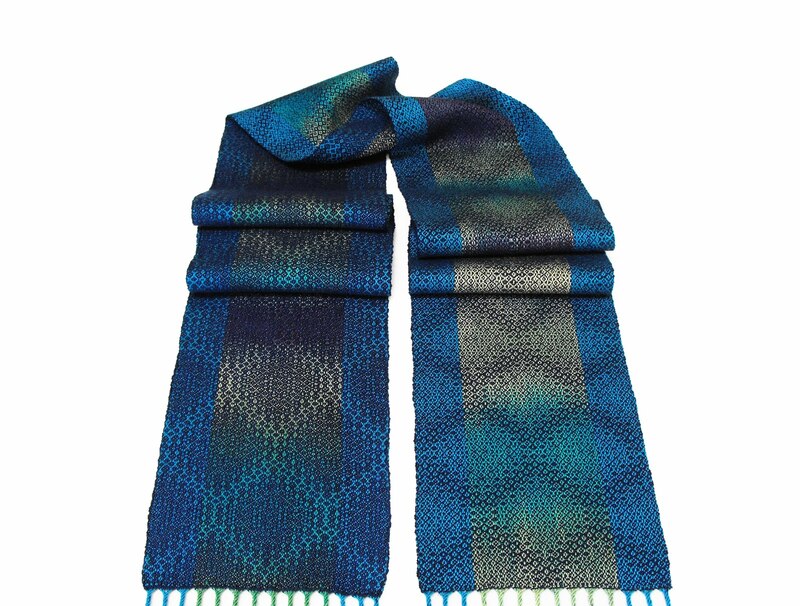 The scarf is lovely, but I'm blown away by the photo of lime grass & purple heather. I should dye that combo.